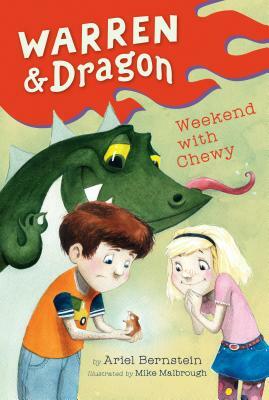 With Calvin and Hobbes appeal, a boy and his "pet" dragon take the school hamster home, to hilarious results! Warren is a seven-year-old boy. Dragon is part stuffed animal, part fierce dragon, and part best friend--depending what you believe most. And Chewy is the class hamster. So when it's Warren's turn to take Chewy home for the weekend, Warren isn't so sure it's the best idea. Do dragons and hamsters mix? Not so well, it turns out, especially when Warren and Dragon are more interested in making cool stuff with their new friends than taking care of a rodent--until Chewy disappears. Oh no! Ariel grew up outside of Philadelphia (developing cheesesteak obsession), went to college at Barnard in New York (developing sushi obsession), and now lives in the suburbs of New Jersey with her family (developing marshmallow obsession). She doesn't have a pet dragon, but does have the occasional herd of deer show up in the backyard. Besides writing children's books, she's worked in a movie theatre, at a Baskin Robbins, as a camp counselor, a paralegal, in human resources, and as a stay-at-home mom. Before his career as a writer-illustrator, Mike was a freelance graphic designer, comic book artist, performer, and teacher with a career spanning two decades. He is the director of ORNG Ink, an after-school studio for young artists, and has received several awards and honors for his work in the community with children and teens. Mike lives in Orange, NJ with his wife, two adventurous kids, and a cat named Agnes that hates him. Visit him at mikemalbrough.com.